Sometimes you want to go where everybody knows your name. It’s not “Cheers,” but it’s Bluffton’s new hotspot, Corner Perk. Now open in its new location in the Bluffton Promenade, this homegrown coffee shop was created for the community by a local entrepreneur. With patrons sitting on bar stools facing May River Road, enjoying delicious cups of in-house roasted coffee and waving to friends as they pass by, this welcoming locale may be Bluffton’s own “Cheers.” Certainly the neighborhood ambiance and the café setting, complete with outdoor seating, make this community hang-out feel like the place where everybody knows everyone. Husband and wife duo, Josh and Cali Cooke, own and operate this sweet local coffee shop. After just over five years at the original location on Burnt Church Road, the Cookes decided they had outgrown their cozy corner coffee house. 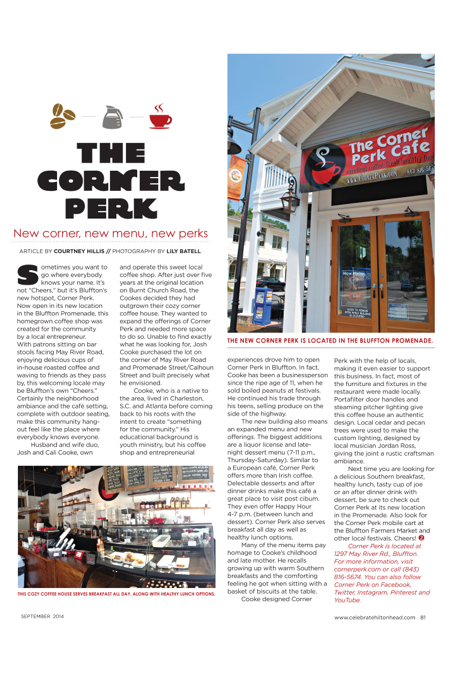 They wanted to expand the offerings of Corner Perk and needed more space to do so. Unable to find exactly what he was looking for, Josh Cooke purchased the lot on the corner of May River Road and Promenade Street/Calhoun Street and built precisely what he envisioned. Cooke, who is a native to the area, lived in Charleston, S.C. and Atlanta before coming back to his roots with the intent to create “something for the community.” His educational background is youth ministry, but his coffee shop and entrepreneurial experiences drove him to open Corner Perk in Bluffton. In fact, Cooke has been a businessperson since the ripe age of 11, when he sold boiled peanuts at festivals. He continued his trade through his teens, selling produce on the side of the highway. The new building also means an expanded menu and new offerings. The biggest additions are a liquor license and late-night dessert menu (7-11 p.m., Thursday-Saturday). Similar to a European café, Corner Perk offers more than Irish coffee. Delectable desserts and after dinner drinks make this café a great place to visit post cibum. They even offer Happy Hour 4-7 p.m. (between lunch and dessert). Corner Perk also serves breakfast all day as well as healthy lunch options. Many of the menu items pay homage to Cooke’s childhood and late mother. He recalls growing up with warm Southern breakfasts and the comforting feeling he got when sitting with a basket of biscuits at the table. Cooke designed Corner Perk with the help of locals, making it even easier to support this business. In fact, most of the furniture and fixtures in the restaurant were made locally. Portafilter door handles and steaming pitcher lighting give this coffee house an authentic design. Local cedar and pecan trees were used to make the custom lighting, designed by local musician Jordan Ross, giving the joint a rustic craftsman ambiance. Corner Perk is located at 1297 May River Rd., Bluffton. For more information, visit cornerperk.com or call (843) 816-5674. You can also follow Corner Perk on Facebook, Twitter, Instagram, Pinterest and YouTube.